MUMBAI: Talking to reporters, producer Mahesh Bhatt, whose Juhu office was attacked on Wednesday morning, said, "It's for the police to find out the motive of the attacker." According to witnesses, the incident occurred at Sukh Jiwan building on Gulmohar road. A young man, clad in jeans and a chocolate-brown T-shirt, rode up on a bike and went to the fourth-floor office of film-maker brothers —Mahesh and Mukhesh Bhatt — in the building. "He seemed to be in his 20s and sported a light stubble. When a cook opened the door to Bhatt's office, the man said, 'Boss kidhar hai?' He had placed his revolver on a box next to the door," said an investigating police officer. The office staff told him that Bhatt was away in Dubai for the IIFA awards. The man, who had stepped inside with his gun, then started abusing and threatened a female staff and an accountant. Eventually, he loaded the revolver and fired one bullet into the floor. At 11.45 am, the office manager called up Bhatt, who was at his home writing an article. Bhatt immediately informed his friend, film-maker Ashok Pandit, who was sitting at Juhu police station at that time. officer. A team of officials recorded the call and sealed the office. Bhatt visited his office in the afternoon accompanied by his wife, Soni Razdan, and film-makers Mohit Suri and Anurag Basu. 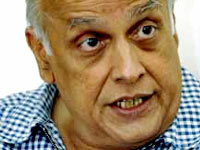 Asked about the abusive phone call, Bhatt said the police had already recorded it and were probing further. "I can only say I'm a citizen of independent India. I've always spoken for the oppressed. I have never taken up social causes to favour any political party, nor do I have connections with any member of the underworld," he said. All rights reserved. No part of this publication and other sites of under liveindia.com may be transmitted or reproduced in any form or by any means without prior permission from the publisher Live India Internet Services or Rajesh Chopra, . Liveindia.com or Mr.Rajesh Chopra is not responsible for any wrong information under this site, For confirmation of any information it is recomended that you can reconfirm from yours end.